For fifty-nine years, the northwest corner of Third and Oak has been the site of a parking lot. For the seventy-four years prior to that, it was occupied by something more; a center of finance and trade, then, art and music. The Ainsworth Building. The Ainsworth Building in 1955. (click on images to expand) -Marion Dean Ross, University of Oregon collection. 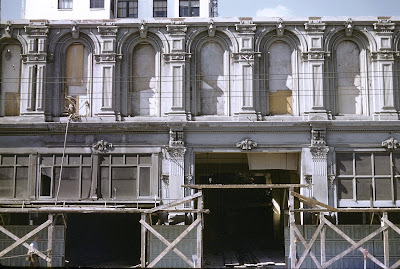 In 1955, architect and historian Marion Dean Ross photographed the Ainsworth Building before and during its demolition. 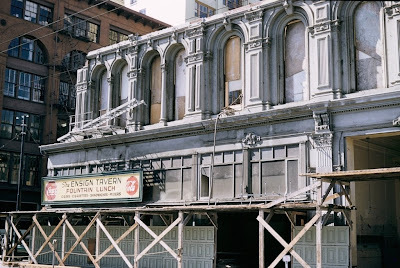 The images, preserved in the University of Oregon's Visual Resources Collection, Architecture and Allied Arts Library, provide a rare look at one of Portland's architectural gems that vanished in the parking lot boom of the 1950s -in color. The pictures are featured later in this piece. They provide an opportunity to appreciate something otherwise lost. When placed in historic context, the story Ainsworth Building and its surrounding area emerges. John C. Ainsworth was a former Mississippi riverboat man (and once worked with Samuel Clemens, aka Mark Twain). He arrived in the Northwest in 1850 at the age of twenty-eight to introduce steam powered transportation to the region. A decade later, his Oregon Steam Navigation Company's monopoly on Columbia River commerce was bringing immense fortunes to him and his Front Street partners and establishing Portland as the regions commercial capital. He retired in 1880 for health reasons to Oakland California where he died thirteen years later. 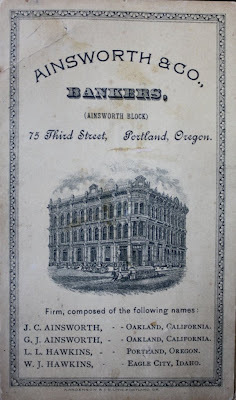 When John C. Ainsworth began construction of his self-named bank in 1880, the area around Third and Oak streets was in the residential outskirts of Portland's riverfront downtown. It was a neighborhood of elm-lined streets, modest white-washed wood houses with neatly fenced yards, interspersed with the early villas of those local plutocrats who had not yet migrated to more exclusive enclaves. The close proximity to the growing commercial district on First and Second portended other uses, a fact not lost on Ainsworth in his Italianate villa on Third, between Pine and Ash (today the location of the Embassy Suites in the former Multnomah Hotel). 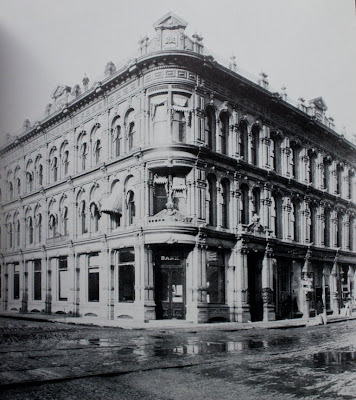 Ainsworth's new bank on the on the corner of Third and Oak was a continuation of the financial ventures he had began in the Idaho Territory, that had been opened up for commercial development by his Oregon Steam Navigation Company. It was to be a final grand gesture in the city where he had made his fortune. To design the bank, he hired San Francisco architect Clinton Day. To build it, he chose Portland's Willamette Iron Works to provide the cast-iron columns, arches, keystones, cornice pieces and pediments. During construction, a temporary bank was opened across the street a half block to the west in the old Colonel Babbit house at Oak and Fourth. 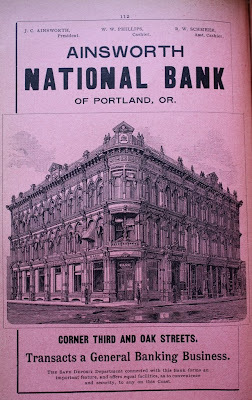 By the time the bank was completed in 1881, it had cost $100,000, making it the most expensive building in Portland to date. The Ainsworth Bank shortly after completion. Note the reversed curved windows on the second floor above the corner entrance, concaved inward to create a balcony, and the Ainsworth monogram atop the pediment. One of the banks partners can be seen on the roof. "The building Day designed was one of the best ever to be constructed in Portland. Its facade showed a remarkable unity of design, with square iron columns defining the structural bays on all three floors. 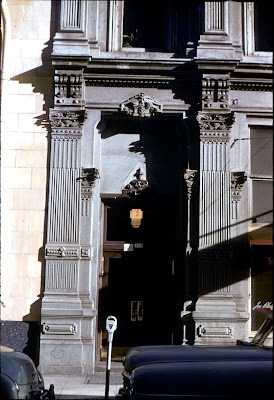 On the main floor at the street and corner entries, the paired iron columns formed monumental portals, among the grandest entrances to be found in the city." 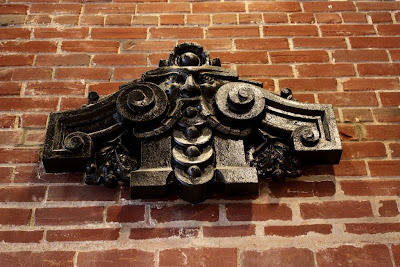 -from The Grand Era of Cast-Iron Architecture in Portland by William John Hawkins III. Ainsworth and Company, Bankers. By the time the bank opened, John C. Ainsworth lived in Oakland. Local management was in the hands of Colonel L.L. Hawkins and his brother William John Hawkins (the grandfather of Portland Architect and Historian William John Hawkins III.) -From the collection of William John Hawkins III. 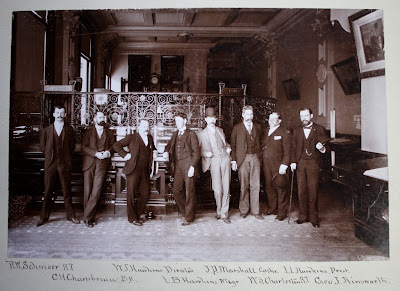 The officers of the Ainsworth Bank, taken in the lobby: R.W. Schmeer, C.H. Chambreau, William John Hawkins, L.B. Hawkins, J.P. Marshall, W.S. Charleston, Colonel L.L. Hawkins and George T. Ainsworth, son of the founder. -From the collection of William John Hawkins III. The Ainsworth Bank faced east towards Portland's advancing downtown. It towered over its smaller residential neighbors. For much of its first decade it was without commercial companions. In 1885 it was re-organized with additional capital, scope and prestige as the Ainsworth National Bank. 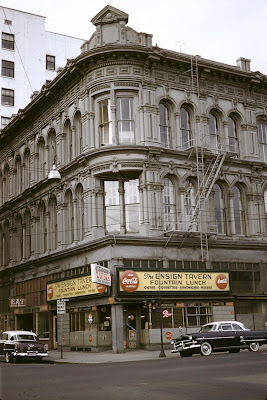 The Ainsworth National Bank, shown with the Ladd and Tilton Bank on First and Stark, (see Lost and Found ). Both would follow the same arch from palatial to pavement. 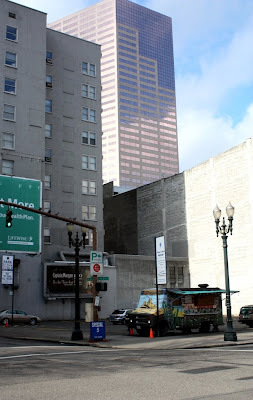 Portland''s downtown caught up with Third Street in the eighteen-nineties. Large scale commercial development rose up an down the new city center. Across the street on Third rose the Worcester Block, a massive pile of brick and sandstone, in the up and coming Romanesque revival style popularized by Henry Hobson Richardson. 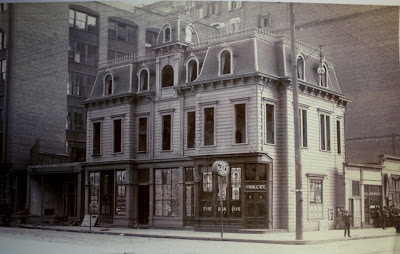 To clear room for more development, the old Ainsworth villa was moved from Third and Pine to a lot diagonally behind the bank facing Forth Street. There, for years to come, it was home to the Arlington Club. 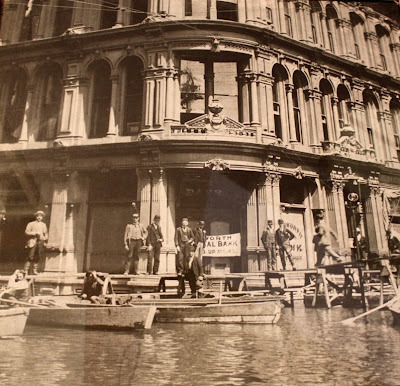 The flood of 1894 showed the high ground on Third Street was not as high as hoped. Note the sign directing Ainsworth Bank patrons upstairs. 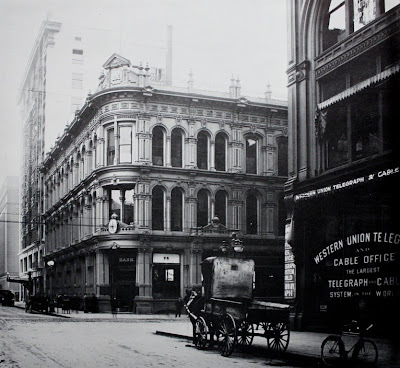 In 1895, the Columbia Building was completed on the street corner diagonal to the bank. Today it is the home the Portland Outdoor Store. The following year it was joined by the late Richardsonian Romanesque styled Sherlock Building (existent). 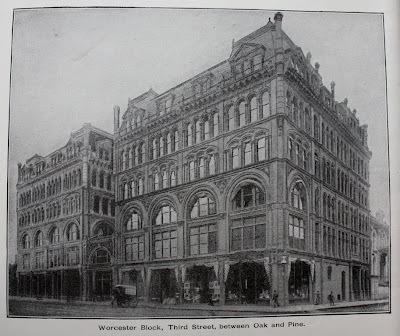 The form of the intersection of Third and Oak: Ainsworth, Worcester, Columbia and Sherlock Buildings, was set for the next forty-six years. The Colonel Babbit house on the corner of Fourth and Oak and the back of the Sherlock Building. Near the end the house was home to the Oak Cafe. In 1880 it had housed the temporary location of the Ainsworth Bank during construction and upstairs the residences of the Hawkins family, where Margaret Hawkins was born. 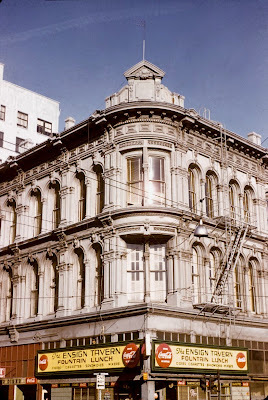 In 1902 the Ainsworth National Bank merged with the United States National Bank, located in the Concord Building on Second and Stark. The Ainsworth Building was selected to be the headquarters of the new, larger United States National Bank (and thus a precursor to today's "Big Pink" building). 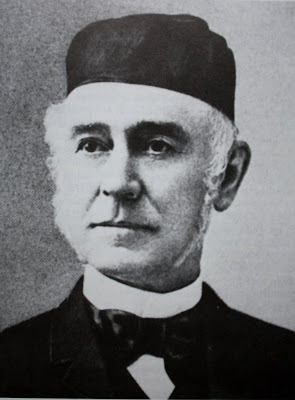 John C. Ainsworth, son of the old banks founder, was elected president of the surviving entity. 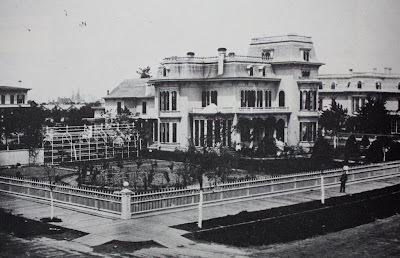 In 1907 the buildings prestige rose once more with the addition of the British Consulate. Flag of the British Consular. The United States National Bank in the Ainsworth Building, taken after 1909 when the Lewis Building was built (today the building houses the 333 Oak Apartments). The Worcester Building is to the right in the immediate foreground. View across Third Street from the Worcester Block after 1909. The Ainsworth Building is to the far right. The Sherlock Building is to the left, and behind it, the Board of Trade Building, built on the site of the old Colonel Babbit house. By 1913 the center of downtown had shifted west of Third Street. 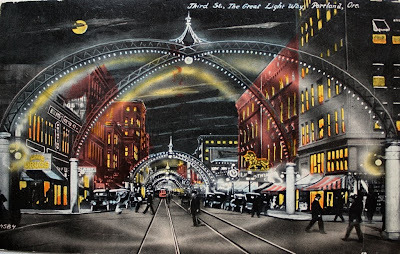 To compete with Fourth, Fifth, Sixth and especially the upstart Broadway, the merchants of Third Street created the "Great Light Way," lit arches that stretched along Third from Madison to Glisan. Spectacular as it was, it could not stop the city centers westward drift. 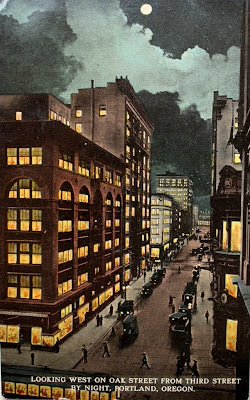 In 1917 the United States National Bank followed the shifting business district, moving to a new building designed by A.E. Doyle at Sixth and Stark. The British Consulate moved out nine years later. Throughout the 1920s a wide variety of enterprises occupied the portions of the Ainsworth Building, including the offices of a Episcopal Church of Oregon deacon, the Chinese American Citizens Alliance, the Cinderella Coat Company, Hexol Sales (wholesale germacides), Suzanne Maryland, a dressmaker, Mineral Concentrates Inc. (medicine manufacturers) and the Pewter Plate Restaurant in rooms #304-308. Rentals declined in the Thirties. In an early example of Portland's love / hate relationship with its history, an article in the Oregon Journal from 1933 called the building a landmark, while noting it was being considered for demolition. Instead, its spacious rooms, tall ceilings and the discovery of great acoustics were deemed perfect for use as music studios. The Ainsworth Building was granted a second incarnation as a music and art center. The second and third floors were converted into studios while the street level space was retained for more workaday uses. A stage with footlights for dramatic presentations was installed in suites #205-205 and a stage for music recitals in #301-303. The Pewter Plate Restaurant remained in its third floor location. For its final decades, the Ainsworth Building was home to a broad spectrum of art and music endeavors. Teachers: piano, choral, drama, broadcast and sculpture came and went, sometimes living in the spacious studios as well, sleeping on couches and cooking on hot plates. Commercial artists rented work space. Tracy R. Grove, a violin make lived and worked on the third floor for eight years. The building was also an early home to the Arts and Crafts Society of Portland's school, founded by Julia Hoffman on the aesthetic and societal principals espoused by William Morris. Today the school is the Oregon College of Art and Craft on SW Barnes Road. In an article in the Oregonian from 1942 announcing a change of ownership, the building was once again described as a Portland landmark. Thirteen years later, it was deemed that a parking lot would be a more profitable use for the land beneath the Ainsworth Building. 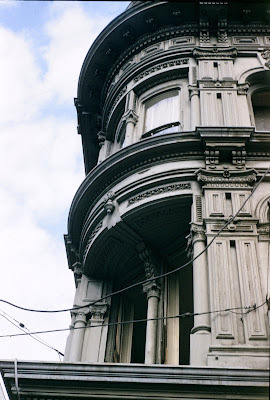 "The building at SW Third and Oak Street is a slightly stuffy but rather proud example of Victorian Architecture. It will be replaced by that symbol of modern living from which the architect has been completely eliminated -the parking lot." -The Oregon Journal, August 24 1955. On Sunday, August 28 1955, a final open house with refreshments and concerts was given for the public, moving from studio to studio with vocal an instrumental music. "It has been a wonderful experience to live here, a great privilege... It's not easy to say why, exactly. There's a spaciousness here and a dignity." -Alicia McElroy, music teacher and Ainsworth resident in the Oregon Journal, August 25 1955. 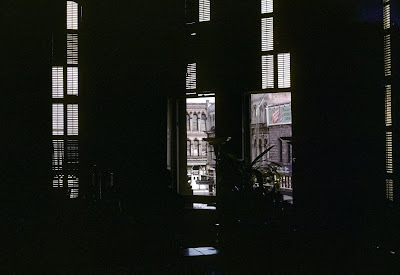 Architect and historian Marion Dean Ross photographed the Ainsworth Building for the first time in 1955 when it was fully intact and still occupied. Later visits occurred during the demolition process. The Ainsworth Building in 1955. The Ensign Tavern and the Niner Diner occupy space remodeled to remove the grand corner and side entrances facing the intersection. Also missing is the Ainsworth monogram atop the pediment. -Marion Dean Ross, University of Oregon Collection. The upper floors of the Ainsworth Building, taken from the Sherlock Building. Note the sign on the Multnomah Hotel, where once stood the Ainsworth Villa. -Marion Dean Ross, University of Oregon Collection. Hallway in the Ainsworth Building. -Marion Dean Ross, University of Oregon Collection. Inside one of the studios. 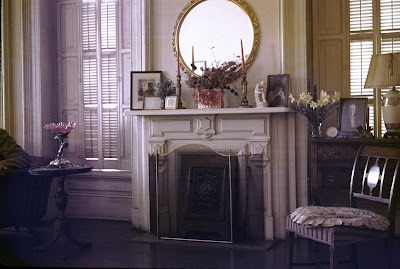 Fireplaces in the Ainsworth Building were made of cast-iron, finished to look like marble. -Marion Dean Ross, University of Oregon Collection. 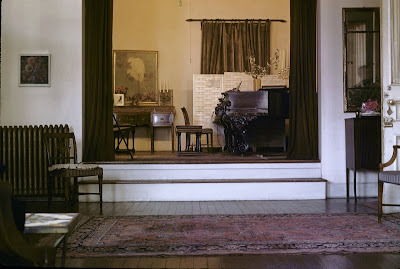 One of the music studios, perhaps that of piano teacher Lillian Pettybone, who lived and worked in the Ainsworth Building for eighteen years. -Marion Dean Ross, University of Oregon Collection. Taken from the second floor room behind the corner balcony. Note the Porltand Outdoor Store through the window. Directly up against it can be seen a portion of the first Sherlock Building (1873) and beyond it, the Cooks Block (1884, demolished 1965). -Marion Dean Ross, University of Oregon Collection. 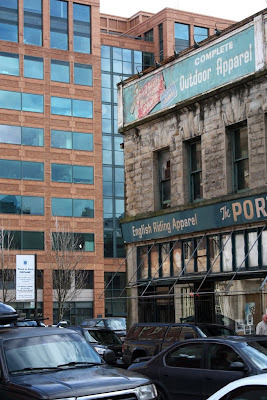 Fifty-four years later from a similar angle at the site of the Ainsworth Building, the same red sign of the Portland Outdoor Store can still be seen. The grand entry way further down Oak that survived the first floor remodeling.-Marion Dean Ross, University of Oregon Collection. 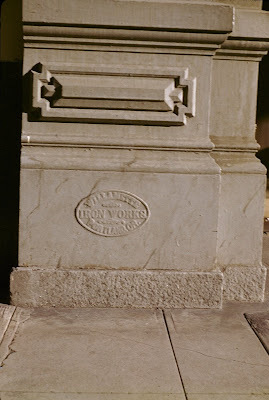 Willamette Iron Works, Portland Oregon builders plate. -Marion Dean Ross, University of Oregon Collection. 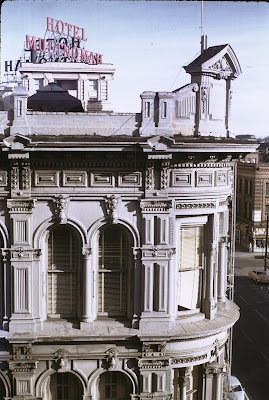 The Ainsworth Building, 1955 . -Marion Dean Ross, University of Oregon Collection. The balcony at the start of demolition. -Marion Dean Ross, University of Oregon Collection. The building was taken down one floor at a time.-Marion Dean Ross, University of Oregon Collection. Mid point in demolition with the Sherlock Building in the background. -Marion Dean Ross, University of Oregon Collection. Parking lot and the Sherlock Building, Third and Oak, 2009. 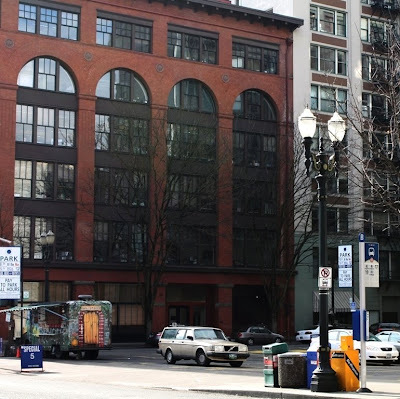 The final known remnant of the Ainsworth Building is on display in the lobby of the Haseltine Building on Second and Pine. 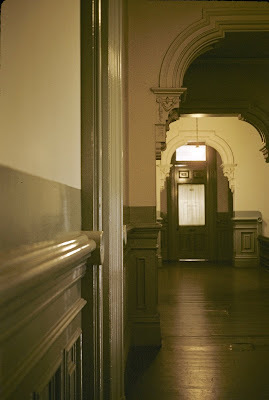 Oddly painted black, it was part of a group of fixtures that punctuated the space between the first and second floor (a good example can be seen in the 1894 flood picture above). Thanks to William J. Hawkins III, for his generous help, and for writing one of my favorite books, and, to the late Marion Dean Ross for being on the scene with a camera. The complete Marion Dean Ross Ainsworth pictures from the University of Oregon Libraries digital collection can be viewed here. The Society of Architectural Historians, Marion Dean Ross / Pacific Northwest Chapters website is here. I changed the official website address to www.cafeunknown.com to rectify a typo that has haunted me since I set up this site. In the old blogspot address (which still works too) I accidentally reversed the o and the w to create the confusing cafeunkown address. I chose the .com suffix over .net .edu or .org because it seemed to be the the easiest to remember - but there is nothing .commercial about this site. Its for the love of the game only. The next (and smaller) post is a couple weeks away. It will be followed by something more theatric in nature. and... I am looking to borrow a picture of the Lowengart Mansion that was torn down in the mid-1930s on the corner of 17th and Davis. All I have ever seen is a drawing in the book Nineteenth Street. If anyone can help, my email address is my first initial, followed by my last name at comcast.net. It would help get a literary themed post stalled for lack of images moving again. The City Council meeting to decide the status of building height zoning changes in the Skidmore Old Town National Historic District has been postponed for the third time, with no announced date rescheduled. News on the issue will appear here when it happens. In other Skidmore news, the addition of restrooms to Ankeny Square will remove the wall in front of the fire station that currently displays cast-iron fixtures (again, oddly painted black) from demolished buildings in the area. A interpretive center which appears on the site map hopefully will restore them to the area. It remains to be seen. After all, Portland has have a love / hate relationship with its history. The exhibit, Cast-iron Portland opens at the Architectural Heritage Center at #701 SE Grand, Friday Evening, April 3rd 2009. All are welcome. Willamette Iron Works builders plate on the Fechheimer and White Building at #233 Front Avenue, similar to the one that once graced the Ainsworth Building. 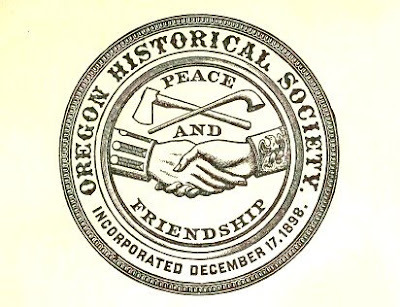 The Oregon Historical Society is facing a extreme shortfall due to loss of state funding. A significant portion of the leg-work for these posts has taken place in the Society's library for which I am grateful. Now more than ever OHS needs our fiscal, moral and political support. HELLO DAN, YOUR PHOTOS ARE GREAT. I AM VERY INTERESTED BECAUSE MY FAMILY NAME IS AINSWORTH AND I WOULD LOVE TO KNOW WHAT CONNECTION MY FAMILY HAS TO THE AINSWORTHS IN AMERICA.THE PHOTO OF THE AINSWORTH MAN RESEMBLES MY DAD SLIGHTLY. Take a look at 532 SE Ankeny (at 6th). A remarkable little building for 1907. Built as a Telephone Exchange, it has wondrously odd wooden windows with circular "rondels" in the upper part, and ornate window surrounds, plus a ornamental dormer above the entrance. I hear a rumor the owner has plans for it that may not be beneficial. Perhaps you could raise some interest in it. The building is a contributing structure in the Grand Ave. historic district. That was a wonderful pictorial history. I am the owner of the Sherlock building and stumbled onto your site. Diane Ericson: Very interesting that your Great Grandparents also met through employment with the Ainsworth family in their house in downtown Portland! I'd love to chat with you about that. I wasn't able to follow you on google plus but if you have the design website in southern Oregon, I've found it and will send a message there. Thanks again to Dan for the wonderful photos and blog. Karen: No, tho' I do a bit of costume design myself, that is a very talented professional with whom I share a name as well as interest. If we are allowed to post email addresses on this site, I will consider contact that way - or check facebook. Knowing where ancestors were is cool enough: knowing what they were doing is fantastic! Diane Ericson: Thanks for your reply! I'm trying to find you on Facebook. Do you have a Chihuly photo as your cover photo? If so, I'll send a message there. Tee-hee - since I'd have to ask what is a chihuly, that would be a no. There is a small photo of a bearded man in a hat and a woman. The background is a B & W line drawing of a bird mask. Oh - is that the chihuly?? Actually, I have seen photos of glasswork by a man of that name - pretty interesting. You could try searching with dee.facebook1 at yahoo - please try soon, because I'll be changing the settings again. Search fb, that is - I do not check that email often.